Swift provides three primary collection types, known as arrays, sets, and dictionaries, for storing collections of values. Arrays are ordered collections of values. Sets are unordered collections of unique values. Dictionaries are unordered collections of key-value associations. Arrays, sets, and dictionaries in Swift are always clear about the types of values and keys that they can store. This means that you cannot insert a value of the wrong type into a collection by mistake. It also means you can be confident about the type of values you will retrieve from a collection. Swift’s array, set, and dictionary types are implemented as generic collections. For more about generic types and collections, see Generics. If you create an array, a set, or a dictionary, and assign it to a variable, the collection that is created will be mutable. This means that you can change (or mutate) the collection after it’s created by adding, removing, or changing items in the collection. If you assign an array, a set, or a dictionary to a constant, that collection is immutable, and its size and contents cannot be changed. It is good practice to create immutable collections in all cases where the collection does not need to change. Doing so makes it easier for you to reason about your code and enables the Swift compiler to optimize the performance of the collections you create. An array stores values of the same type in an ordered list. The same value can appear in an array multiple times at different positions. Swift’s Array type is bridged to Foundation’s NSArray class. For more information about using Array with Foundation and Cocoa, see Bridging Between Array and NSArray. The type of a Swift array is written in full as Array<Element>, where Element is the type of values the array is allowed to store. You can also write the type of an array in shorthand form as [Element]. Although the two forms are functionally identical, the shorthand form is preferred and is used throughout this guide when referring to the type of an array. Note that the type of the someInts variable is inferred to be [Int] from the type of the initializer. The shoppingList variable is declared as “an array of string values”, written as [String]. Because this particular array has specified a value type of String, it is allowed to store String values only. Here, the shoppingList array is initialized with two String values ("Eggs" and "Milk"), written within an array literal. The shoppingList array is declared as a variable (with the var introducer) and not a constant (with the let introducer) because more items are added to the shopping list in the examples below. In this case, the array literal contains two String values and nothing else. This matches the type of the shoppingList variable’s declaration (an array that can only contain String values), and so the assignment of the array literal is permitted as a way to initialize shoppingList with two initial items. Because all values in the array literal are of the same type, Swift can infer that [String] is the correct type to use for the shoppingList variable. You access and modify an array through its methods and properties, or by using subscript syntax. The first item in the array has an index of 0, not 1. Arrays in Swift are always zero-indexed. When you use subscript syntax, the index you specify needs to be valid. For example, writing shoppingList[shoppingList.count] = "Salt" to try to append an item to the end of the array results in a runtime error. This call to the insert(_:at:) method inserts a new item with a value of "Maple Syrup" at the very beginning of the shopping list, indicated by an index of 0. If you try to access or modify a value for an index that is outside of an array’s existing bounds, you will trigger a runtime error. You can check that an index is valid before using it by comparing it to the array’s count property. The largest valid index in an array is count - 1 because arrays are indexed from zero—however, when count is 0 (meaning the array is empty), there are no valid indexes. // firstItem is now equal to "Six eggs"
For more about the for-in loop, see For-In Loops. A set stores distinct values of the same type in a collection with no defined ordering. You can use a set instead of an array when the order of items is not important, or when you need to ensure that an item only appears once. Swift’s Set type is bridged to Foundation’s NSSet class. For more information about using Set with Foundation and Cocoa, see Bridging Between Set and NSSet. A type must be hashable in order to be stored in a set—that is, the type must provide a way to compute a hash value for itself. 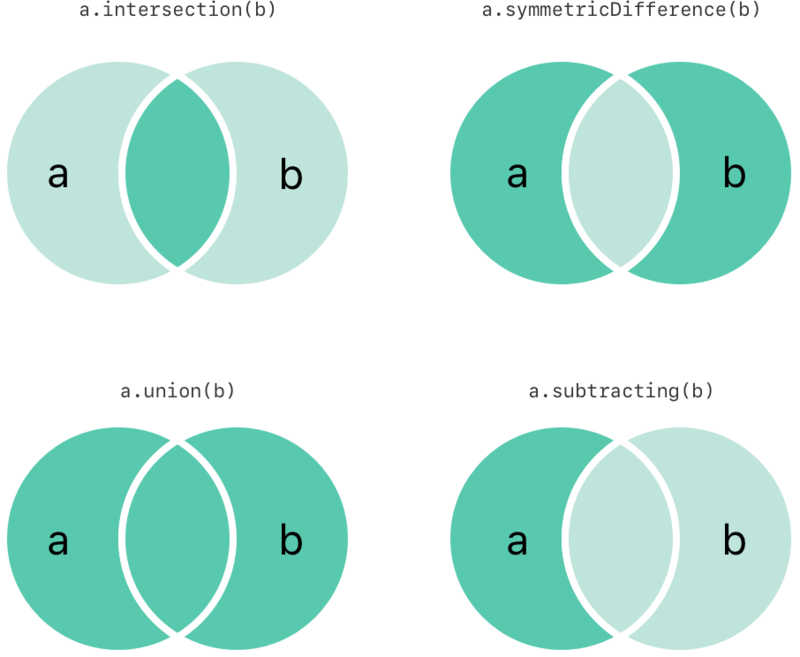 A hash value is an Int value that is the same for all objects that compare equally, such that if a == b, it follows that a.hashValue == b.hashValue. All of Swift’s basic types (such as String, Int, Double, and Bool) are hashable by default, and can be used as set value types or dictionary key types. Enumeration case values without associated values (as described in Enumeration) are also hashable by default. You can use your own custom types as set value types or dictionary key types by making them conform to the Hashable protocol from Swift’s standard library. Types that conform to the Hashable protocol must provide a gettable Int property called hashValue. The value returned by a type’s hashValue property is not required to be the same across different executions of the same program, or in different programs. For more information about conforming to protocols, see Protocols. The type of a Swift set is written as Set<Element>, where Element is the type that the set is allowed to store. Unlike arrays, sets do not have an equivalent shorthand form. // Prints "letters is of type Set<Character> with 0 items." The type of the letters variable is inferred to be Set<Character>, from the type of the initializer. You can also initialize a set with an array literal, as a shorthand way to write one or more values as a set collection. The favoriteGenres variable is declared as “a set of String values”, written as Set<String>. Because this particular set has specified a value type of String, it is only allowed to store String values. Here, the favoriteGenres set is initialized with three String values ("Rock", "Classical", and "Hip hop"), written within an array literal. The favoriteGenres set is declared as a variable (with the var introducer) and not a constant (with the let introducer) because items are added and removed in the examples below. Because all values in the array literal are of the same type, Swift can infer that Set<String> is the correct type to use for the favoriteGenres variable. You access and modify a set through its methods and properties. // Prints "I have 3 favorite music genres." // Prints "I have particular music preferences." You can remove an item from a set by calling the set’s remove(_:) method, which removes the item if it’s a member of the set, and returns the removed value, or returns nil if the set did not contain it. Alternatively, all items in a set can be removed with its removeAll() method. // Prints "Rock? I'm over it." To check whether a set contains a particular item, use the contains(_:) method. // Prints "It's too funky in here." You can iterate over the values in a set with a for-in loop. Swift’s Set type does not have a defined ordering. To iterate over the values of a set in a specific order, use the sorted() method, which returns the set’s elements as an array sorted using the < operator. You can efficiently perform fundamental set operations, such as combining two sets together, determining which values two sets have in common, or determining whether two sets contain all, some, or none of the same values. The illustration below depicts two sets—a and b—with the results of various set operations represented by the shaded regions. Use the intersection(_:) method to create a new set with only the values common to both sets. Use the symmetricDifference(_:) method to create a new set with values in either set, but not both. Use the union(_:) method to create a new set with all of the values in both sets. Use the subtracting(_:) method to create a new set with values not in the specified set. 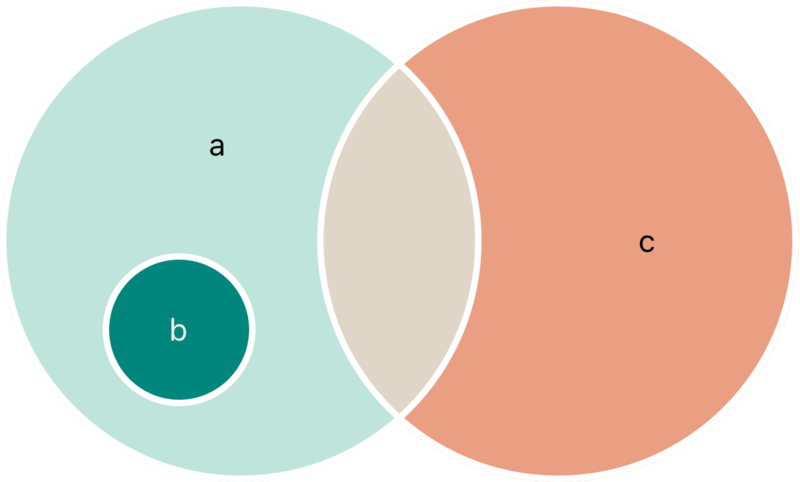 The illustration below depicts three sets—a, b and c—with overlapping regions representing elements shared among sets. Set a is a superset of set b, because a contains all elements in b. Conversely, set b is a subset of set a, because all elements in b are also contained by a. Set b and set c are disjoint with one another, because they share no elements in common. Use the “is equal” operator (==) to determine whether two sets contain all of the same values. Use the isSubset(of:) method to determine whether all of the values of a set are contained in the specified set. Use the isSuperset(of:) method to determine whether a set contains all of the values in a specified set. Use the isStrictSubset(of:) or isStrictSuperset(of:) methods to determine whether a set is a subset or superset, but not equal to, a specified set. Use the isDisjoint(with:) method to determine whether two sets have no values in common. A dictionary stores associations between keys of the same type and values of the same type in a collection with no defined ordering. Each value is associated with a unique key, which acts as an identifier for that value within the dictionary. Unlike items in an array, items in a dictionary do not have a specified order. You use a dictionary when you need to look up values based on their identifier, in much the same way that a real-world dictionary is used to look up the definition for a particular word. Swift’s Dictionary type is bridged to Foundation’s NSDictionary class. For more information about using Dictionary with Foundation and Cocoa, see Bridging Between Dictionary and NSDictionary. The type of a Swift dictionary is written in full as Dictionary<Key, Value>, where Key is the type of value that can be used as a dictionary key, and Value is the type of value that the dictionary stores for those keys. A dictionary Key type must conform to the Hashable protocol, like a set’s value type. You can also write the type of a dictionary in shorthand form as [Key: Value]. Although the two forms are functionally identical, the shorthand form is preferred and is used throughout this guide when referring to the type of a dictionary. This example creates an empty dictionary of type [Int: String] to store human-readable names of integer values. Its keys are of type Int, and its values are of type String. You can also initialize a dictionary with a dictionary literal, which has a similar syntax to the array literal seen earlier. A dictionary literal is a shorthand way to write one or more key-value pairs as a Dictionary collection. The airports dictionary is declared as having a type of [String: String], which means “a Dictionary whose keys are of type String, and whose values are also of type String”. The airports dictionary is declared as a variable (with the var introducer), and not a constant (with the let introducer), because more airports are added to the dictionary in the examples below. The airports dictionary is initialized with a dictionary literal containing two key-value pairs. The first pair has a key of "YYZ" and a value of "Toronto Pearson". The second pair has a key of "DUB" and a value of "Dublin". This dictionary literal contains two String: String pairs. This key-value type matches the type of the airports variable declaration (a dictionary with only String keys, and only String values), and so the assignment of the dictionary literal is permitted as a way to initialize the airports dictionary with two initial items. Because all keys in the literal are of the same type as each other, and likewise all values are of the same type as each other, Swift can infer that [String: String] is the correct type to use for the airports dictionary. You access and modify a dictionary through its methods and properties, or by using subscript syntax. As an alternative to subscripting, use a dictionary’s updateValue(_:forKey:) method to set or update the value for a particular key. Like the subscript examples above, the updateValue(_:forKey:) method sets a value for a key if none exists, or updates the value if that key already exists. Unlike a subscript, however, the updateValue(_:forKey:) method returns the old value after performing an update. This enables you to check whether or not an update took place. // Prints "The name of the airport is Dublin Airport." // Prints "The removed airport's name is Dublin Airport." Swift’s Dictionary type does not have a defined ordering. To iterate over the keys or values of a dictionary in a specific order, use the sorted() method on its keys or values property.